In 1963, the thrilling 007 film From Russia with Love debuted with much fanfare and. although the iconic Scotsman Sean Connery did not appear during my recent Russian cruise, I made friends with many memorable travelers from all parts of the globe. 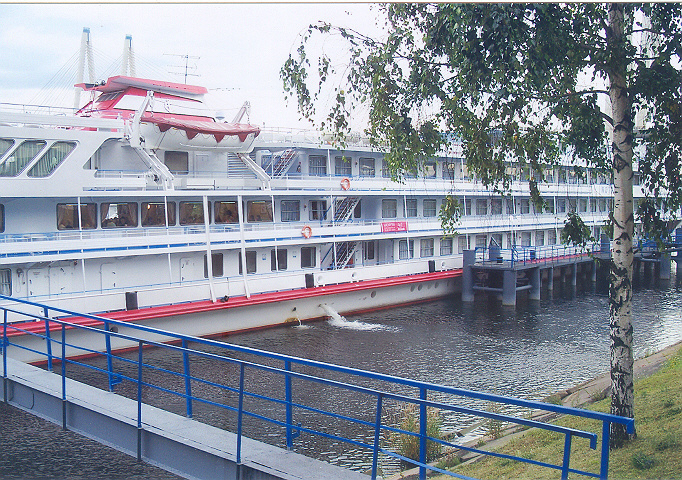 Little did I imagine when I boarded the MS Leo Tolstoy in St. Petersburg, Russia for a river cruise that I would spend the next two weeks in the company of citizens from 14 different countries while discovering this historic region. Following a long flight I comfortably cocooned myself in my stateroom arranging my belongings then headed to the dining room where throngs of passengers had already assembled and had already delved in to their first meal in Russia. Scoping out the array of diners, I invited myself to join a well-traveled aristocratic woman from Bombay, India. During the course of our cruise, I learned about her lavish lifestyle, her children, her arranged marriage and her solo travel experiences. At 9:00 the following morning, I followed Tania, our knowledgeable 20 year old Russian guide and university student onto the awaiting Mercedes bus for a taste of St. Petersburg. Astounded, as we drove along through the city’s downtown area I viewed one of the most beautiful cities I have ever visited, not at all what I had imagined. Its 2003 facelift injected it with a new life, restoring the grand architecture of its landmark buildings to their original glory. 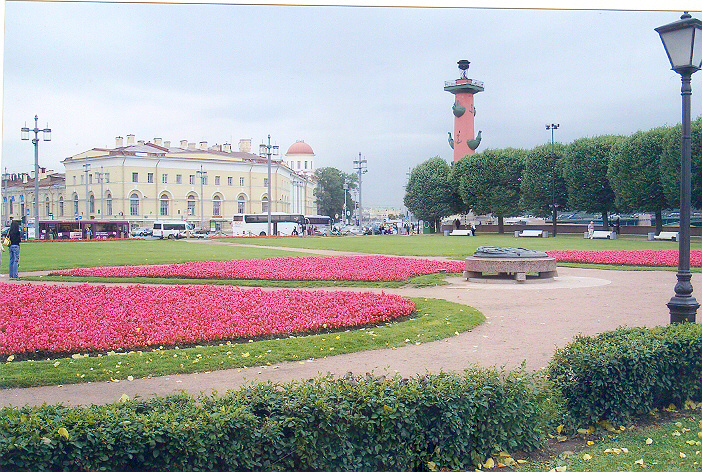 We passed well tended lush parks and beds of brightly colored flowers, monuments, gilded domes and statues, a variety of architecture from the ornate pale green, gold and white baroque of the world renowned Hermitage Museum to modern western style hotels, cafes and trendy shops. We drove along posh Nevsky Prospect, the main boulevard where the city’s celebrities chose to take up residence. 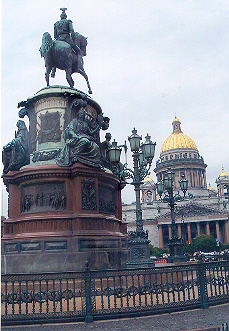 We continued through Palace Square, a vast open gathering space centered by a 154 foot column commemorating Russia’s victory over Napoleon’s army then passed over a variety of handsome bridges spanning the cities canals and Neva River. Stopping at St. Isaac’s Square our guide offered some history on the impressive St. Isaac’s cathedral which took more than 40 years to complete. Gold leaf covers one of the world’s largest domes with majestic 114 ton granite Corinthian columns gracing the entrance. Stopping for a lunch break I struck up a conversation about the day’s sighting with two couples from Greece. 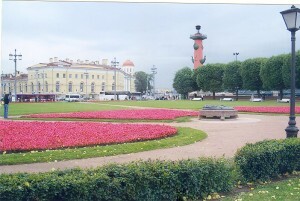 What followed was a one hour excursion via hydrofoil to Peterhof Palace known as the “Russian Versailles” on the shores of the Gulf of Finland where I continued my chat with one of the women in the group. During the course of the two weeks of our Russian adventure she regaled me with stories of Greek mythology, a subject near and dear to my heart. On our last day together, I learned that she was a University Professor in Athens and member of the Greek Parliament. Arriving at Peterhof, the brainchild of Peter the Great, where construction begun in 1715, I meandered around its astoundingly beautiful gardens, elaborate fountains and opulent palaces. Peter was always trying to keep up with the French. Although the Nazi occupation of the complex during WWII caused severe damage, Peterhof has been completely restored to its original grandeur and currently houses many of its original treasures including crystal chandeliers and paintings which were fortunately carried away for safekeeping during the war. 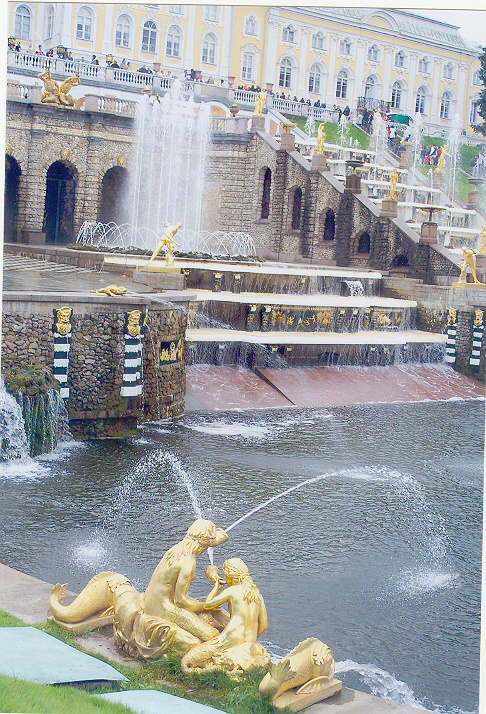 The main palace overlooks the tumbling waters of the impressive Grand Cascade, the largest of 150 gold embellished elaborate fountains in the 2,500 acre park. Hundreds of visitors strolled the grounds and toured the palaces, absorbed in the beauty of this extraordinary royal retreat. 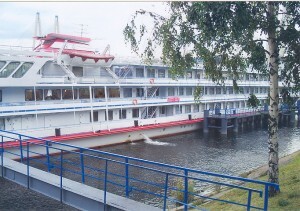 Back on board the Tolstoy, I continued my table hopping, settling that evening with two Australian women from Adelaide. One of them, a gutsy competitive dragon boat racer who also spent much of her free time caravanning in the outback, fascinated me with stories about some of her adventures. The following day, we headed to the renowned Hermitage revealing the treasures of one of the world’s oldest, largest and most preeminent museums. 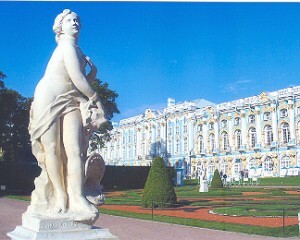 Founded by Catherine the Great, the museum consists of a complex of six buildings including the former Winter Palace. The opulent rooms reflect the lifestyle of the imperial regime with gilded columns and crystal chandeliers abounding. It houses nearly three million works of art including the largest collection of paintings in the world with representative works by such renowned artists as Rembrandt, Rubens, Velazquez, Goya, Raphael, da Vinci, Matisse and van Gogh. The Malachite Room awed visitors with two tons of the semi-precious green stone fashioned into a single sculpture. Days could easily be spent perusing the rooms of this colossal museum but alas, there is never enough time. Another one of St. Petersburg’s most renowned landmarks, also designed by Peter the Great, the Peter and Paul fortress stands on the banks of the Neva River. From a distance, I could see the gold leaf spire of the Peter and Paul Cathedral, the most dominant structure within the fortress. 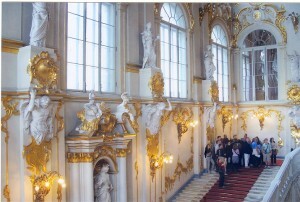 The opulent interior, jammed with as much gold as with visitors, is the burial site of Peter and most of his successors including the Romanovs. The fortress also housed a prison where Peter the Great’s own son Alexis spent his last days in the dungeons before being executed. Generations of political prisoners followed including Trotsky, Gorky, Dostoyevsky and Lenin’s older brother, Alexander to mention a few. Back on the bus, I discussed the day’s sightings with a fit and fascinating Irish octogenarian couple who had recently returned from an adventurous trip to Antarctica. I later dined with the Canadian contingency with representatives from Victoria to Toronto, all sharing impressions of the highlights of our tours of St. Petersburg. Another day’s outing took us to Catherine’s Palace & Park (not Catherine the Great) where a band greeted us outside the elaborate entrance gates switching from classical to contemporary tunes. We made our way down the path to the Rococo style edifice and toured the lavish interior of this royal summer residence. A guide explained the design and contents of each room and offered a detailed description on the subject of what is known in some circles as the Ninth Wonder of the World, the prized Amber Room. Although WWII bombings destroyed much of the palace and its contents they have been faithfully reconstructed from photographs. The whereabouts of what comprised the original Amber Room remain a mystery. Time spent aboard the Tolstoy gave our friendly and diverse group an opportunity to share experiences and impressions of St. Petersburg. On board, my 150 fellow travelers gathered together in the several public rooms, on deck or hovering around the 24 hour coffee, tea and cookie service. The ship’s learned guest speakers regularly enhanced our knowledge and insight into the history of this great city, its iconic treasures such as the Faberge eggs and Russian nest dolls, its music and we even learned how to make blinys as we bid farewell to this memorable city to continue our Russian adventure.